“The hardest part about deregulating was that the government had forgotten how to do it,” Office of Management and Budget (OMB) Director Mick Mulvaney explained in his interview at the Conservative Political Action Conference (CPAC) on Saturday. The interview focused around three areas: deregulatory successes, the president’s budget, and the effects of December’s historic tax reform legislation. Of significant note in his remarks were the broad scope of unparalleled wins the administration has delivered in the deregulation effort. 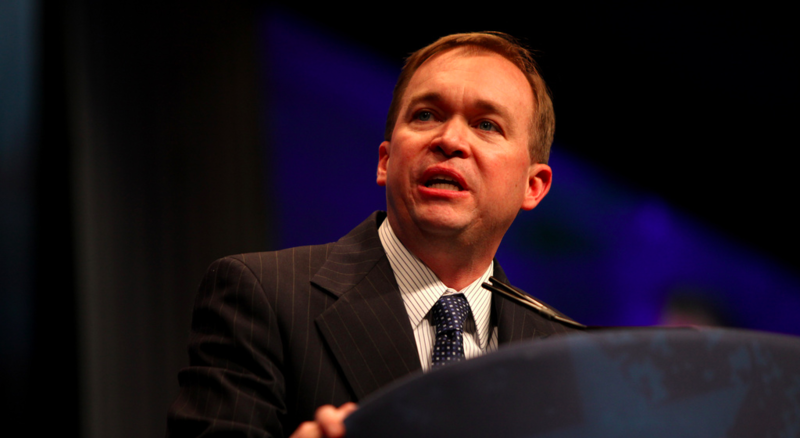 Mulvaney said that he is often referred to as the “budget director,” which he says is “fine,” but that the role is about much more than that. Specifically, it is also about the deregulation agenda which has been a central focus of the Trump administration in its first year. This crucial role was made evident by Mulvaney’s detectable passion in speaking about the administration's massive successes in deregulation thus far. As Mulvaney cited, many of the people in the bloated government bureaucracy currently had not even been born during the last major deregulation effort — even the forms to roll back rules were hard to find, while the forms to create new rules were readily available. This is no surprise coming from the Obama era, when executive branch action to add new regulations was rampant, and heavy-handed regulation in every area of the economy was the norm. The tune has shifted, however, with Mulvaney’s leadership at the OMB, the federal agency through which all regulatory actions must run. With Mulvaney leading the efforts, the administration has far surpassed the goal that the administration set for itself during the campaign — that a Trump presidency would mean two rules eliminated for each new regulation. At the end of 2017, this ratio was twenty-two to one. In fact, he expressed that his role in deregulation is no where near to complete. Giving insight into the nature of the deregulatory effort, he said that, fortunately, “everything that the Obama administration did without Congress, we can undo without Congress.” Along these same lines, the ease with which the regulations were created indicate the ease with which they can be rolled back. The regulations slashed in the first year, Mulvaney explained, are those that the Obama administration put in with relative ease. The larger lifts — more complex rules that took years to formulate — such as the Waters of the United States rule and the Clean Power Plan, are more difficult to roll back, and will be primary focuses of the deregulatory effort in the administration in 2018. Needless to say, there are now likely few in the bureaucracy who are not familiar with deregulatory efforts, and I am certain that the forms to roll back rules are no longer hard to find. As Mulvaney put it simply about deregulation, “It’s a priority for us, get it done.” FreedomWorks applauds the successes of last year’s regulatory rollback, and looks forward to the successes that lie ahead in freeing our economy of heavy-handed, competition-stifling regulations. Watch Director Mulvaney’s interview at CPAC in its entirety here. If you are connect the window10 with wireless display and you will enjoy the first function are important of the Maine rules are on this http://windowstuts.net/mobile place if you are agree to enjoy the best of the best option on this website. In our continuing efforts to roll back regulatory red tape, FreedomWorks is urging members of Congress to sign onto an initiative started by Rep. Bill Posey (R-Fla.). Welcome to FreedomWorks Foundation’s sixth regulatory review! Our Regulatory Action Center proudly updates you with our favorite tidbits from the swamp. We want to smash barriers between bureaucracy and the American people by delivering regulatory news straight to FreedomWorks activists. Check back in two Fridays for the next edition. On April 10, 2018, President Donald J. Trump signed the Executive Order on Economic Mobility. President Trump’s plan outlines nine “principles of economic mobility” that are bound to lift struggling Americans towards self-sufficiency. Among these principles are boosting employment, promoting stable families, and choosing federalism over top-down programs. On behalf of our activist community, I urge you to contact your representative and ask him or her to vote NO on H.Res. 796 and the Consolidated Appropriations Act, H.R. 1625. H.Res. 796 is the rule governing the Consolidated Appropriations Act. The underlying bill is a consolidated appropriations bill packed with unrelated legislative items that Congress has not been able to pass. We oppose the rule governing the underlying bill because of process by which leadership wrote the bill. We oppose the omnibus both because of the process and because it appropriates at the spending levels under the Bipartisan Budget Act. The White House unveiled its FY 2019 budget request this morning. Although it's incredibly unlikely that the budget request will become law, it does provide a window into the policy priorities of the Trump administration. Of course, the passage of the Bipartisan Budget Act, H.R. 1892, set the discretionary spending level for FY 2019 at $1.321 trillion -- $716 billion for defense discretionary and $605 billion nondefense discretionary. This level of spending is $153 billion higher than the pre-Bipartisan Budget Act spending caps. On behalf of our activist community, I urge you to contact your senators and representative and ask them to support the Guidance Out Of Darkness (GOOD) Act, S. 2296 and H.R. 4809, introduced by Sen. Ron Johnson (R-Wis.) and Rep. Mark Walker (R-N.C.). The bill would require federal agencies to post regulatory guidance documents online, making them more accessible to those businesses affected by the guidance and to the American public generally.